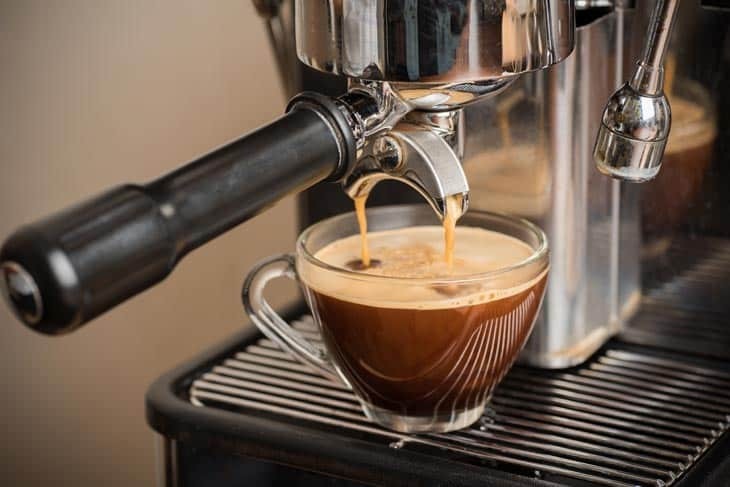 Coffee is probably the most popular drink for people in the morning, and a delicious Espresso is probably one of the most sought-after varieties. As a coffee lover, you would eventually find yourself looking at brewing our own espresso but you don't have to break the bank to do so. 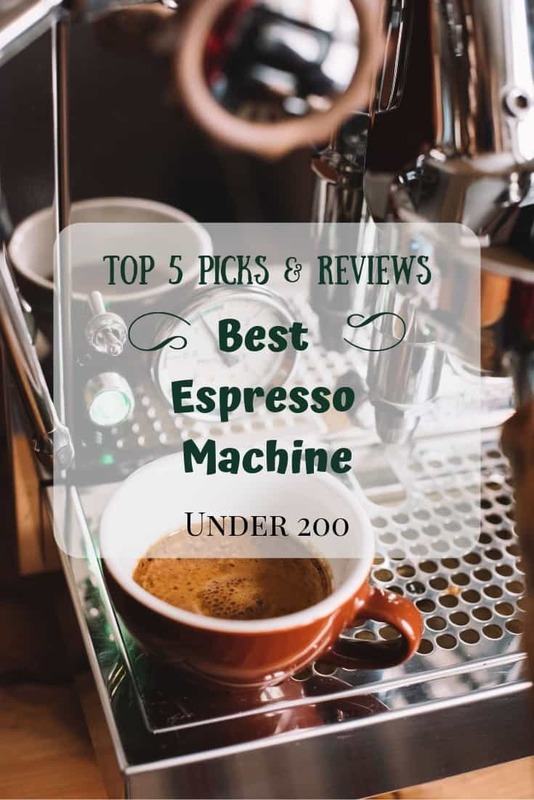 Below I have listed what I think are the best espresso machines under $200 on the market. When I first got my espresso machine, I remember that I didn't have a huge budget as well. I didn't want to spend too much in case I end up not liking brewing my own coffee, but I also wanted to get a decent enough machine that would still give me the right kick to get a good start in the morning. Personally, I think that $200 is the best price range. After all, if you are like me, you want a nice espresso shot without breaking the bank. You'll get a lot of choices with decent features without breaking the bank. The fact that it has a lot of choices has its pros and cons. With the variety, you can surely get one that suits your taste but you can also easily get lost and get confused with choosing. Also remember, that it is crucial to also pick the best coffee beans for espresso that you can. This is a common question. Let's be honest, there are many different coffee terms out there so it can be confusing. Espresso is essentially highly pressurized near boiling water shot thru finely ground coffee beans that are heavily packed. When it comes out, the coffee is in a shot, is dark brown, and thick. Quick Tip: If you want to get tips on picking the best espresso beans, you can check out our new article on the topic. 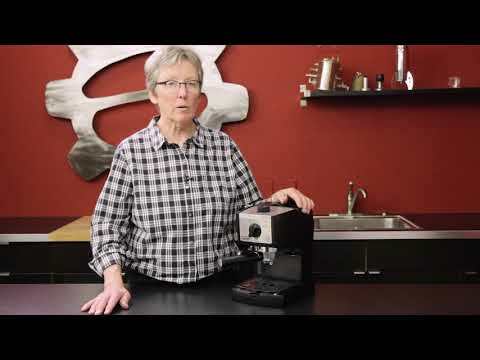 What is a steam wand for espresso machines? If you’re looking for a machine that is multifunctional, this one from De’Longhi is the one for you. It doesn’t just make espresso and espresso shots but you can also have a cup of cappuccino or even a cup of latte. It’s also very flexible when it comes to the type of coffee you can use it. You can either use regular coffee beans or use a coffee pod. It has a temperature maintenance feature which allows you to have a cup after another cup. The water tank is also easy to install and reinstall for cleaning. This machine also comes with a fully functioning steam wand. Finally, what I was really impressed with this is how durable the body is. It’s made of stainless steel so you’ll have your machine for years to come. A steam wand is simply a round piece of metal that sticks out of the machine at an angle. The purpose is to gently froth or foam your milk. It warms your milk and creates those beautiful frothy bubbles that we all love in our espresso. It is easy to use and is very versatile. You can make espressos, cappuccinos, and even lattes with just one machine. It is very durable and also easy to clean. Despite being a powerful machine, it is still below 100 bucks! The machine vibrates while it’s making your coffee so it is advisable to hold your cup and not just let it sit on the holder to avoid spillage. After continuous, use the pressure becomes less. This Mr. Coffee espresso maker is a steam driven machine which means that it uses steam to give you fresh and great smelling coffee. This also has a milk frother and can give you up to 4 cups of coffee. It has a removable drip catcher which allows you to catch any coffee drips to keep your coffee station -- or your countertop-- clean. It is made of stainless steel and also has an easy pour carafe made of glass so you can have hassle-free drinking. You can make cappuccinos as well as lattes with this espresso machine. It has a built-in milk frother so you can top your coffee with the right amount of milk. It is relatively cheaper compared to others on the list. It is almost purely manual since it is a steam driven machine so if you’re always on the go like me this wouldn’t be ideal. This espresso machine is a perfect fit for those who want professional looking and tasting coffee. It’s also a great choice for those who are always on the go since you get coffee with just a quick touch of a button. But, what really caught my eye with this is that it features an Aeroccino which promises to give great tasting coffee through an automatic system. You can also make both hot and cold drinks with this machine. The manufacturers include a package of a variety of coffee with each purchase of the set. It has a power saving feature and automatically switches off once it has been on standby for over 9 minutes. It is purely automatic and very versatile with the variety of drinks you can make. More expensive than the other machines on the list which gives the same quality of coffee. After a couple of uses, I noticed that water started to leak at the bottom of this machine. This Mr. Coffee espresso machine is a great 3-in-1 coffee maker which allows you to have a variety of drinks depending on your taste. 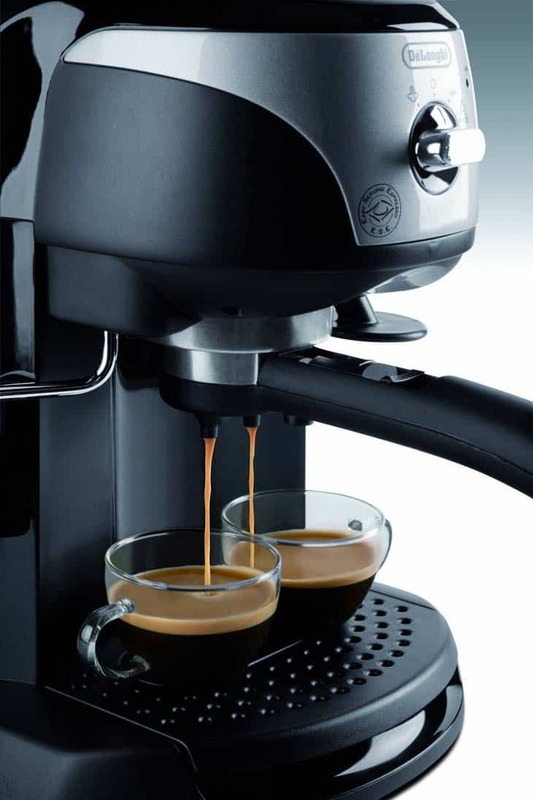 It has a 15-bar pump system so you’re sure that you’ll get rich espresso every single time. It has an automatic milk frother so no need to manually press your milk and guess how much you’ll need. It also features a panel where you can choose whatever coffee you want for the day. This is a 3-in-1 machine, so you can make both espressos and cappuccinos using this single machine. It is very easy to use and you can get coffee with just a single touch of the button. It is one of the most expensive ones on the list although cheaper ones have the same features. The temperature can get too hot and are not food for drinking. 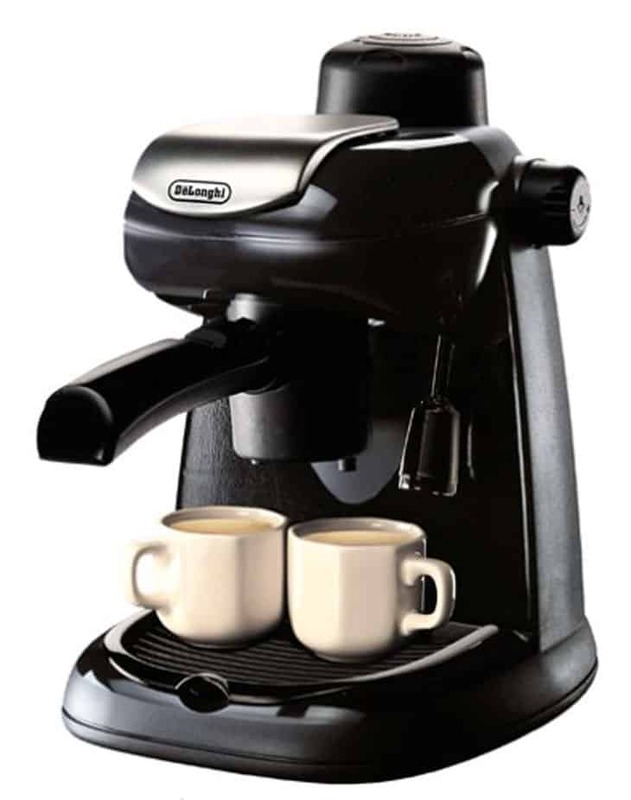 This espresso maker from Hamilton Beach packs a powerful 15 bar Italian pump which ensures that there are no coffee grounds that would get stuck on your machine. This would save you from the hassle of cleaning your machine and trying to get rid of all the grounds. It also has a refillable water reservoir that’s easy to install and reinstall so that you can won’t have to worry about running out of coffee. Lastly, this Hamilton Beach espresso maker also feature a great milk frother so you can also make cappuccinos. It is very easy to use. In fact, you just need to push a single button to get it working. It makes both espressos and cappuccinos so you can switch between coffees each day. After continuous use, I noticed that the water started to leak out from the reservoir. It only serves two cups of coffee which would be a problem for those like me who have a bigger family. 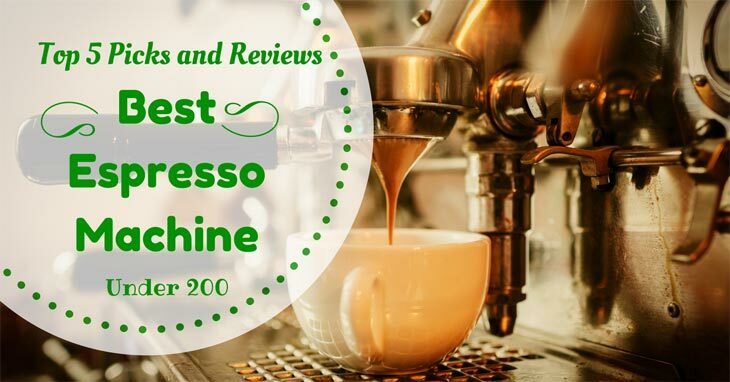 Best #espresso machine under 200: Best reviews and a complete guide. Knowing exactly what to look for in a great espresso machine will allow you to have the best results. It would also ensure that you are making a smart purchase. You also want to make sure that you are making truly delicious espresso, so let's get into it. The durability of anything you purchase should be your top priority. You wouldn’t want to spend so much on something only for it to end up breaking after just a couple of uses. How durable your machine should depend on how often you would be using it. If you foresee that you would be using it almost the whole day, then getting one which is professional-grade. However, if you’ll only be using it once a day, you can get away with buying a cheaper one. The capabilities that you would want your machine to have depends on how much you are willing to put an effort. These capabilities include having a blade grinder or a burr grinder, a milk frother, and being able to boil hot water. Among all these, I personally think that having a machine with a grinder is most important. This would save you from having to buy pre-ground beans which can give you coffee with inferior taste and smell. The milk frother is something that most could live without especially if you don't really like milk on your espresso, but a water boule is essential. Aside from all these making capabilities, I also recommend that you look for a machine which is multifunctional. Wouldn't it be great to get an espresso machine and a cappuccino machine in just one purchase? There are two different kind of grinders to choose from. You can choose from a burr grinder or a blade grinder. A burr grinder tends to be a bit more expensive but provides the best consistent grind to your coffee beans. The type of espresso machine that you'll get will depend on what you want to accomplish and how much work you're willing to put on your coffee. Steam-driven espresso machines were the first ones that were available in the market. In fact, the first espresso machine was steam driven. This machine works by moving hot water in steam form to the coffee grinds. I usually do not see this type of machine anymore. However, some small coffee shops still use them. Since it uses an old technique, you should expect that you would be needing a whole lot of effort and good technique to get just the right result. But since it doesn't have a ton of machinery it is very cheap. I personally haven't used this type of machine and I also wouldn't recommend it for beginners. This is more for cafes rather than using at home. Pump-driven espresso machines were first introduced in the market in the 60’s. This type of machine is also known as a motor-driven machine and this is the most common type of espresso machine in the market. It is also one of the easiest to use and I would highly recommend to beginners and home brewers. It uses electricity as a source of power making brewing easier and more powerful. Semi-automatic machines are perfect for those who want to be in total control over what they are drinking. As the name suggests, this machine uses machinery as well as your skill in order to get the best kind of espresso. It may be a bit surprising to you, this type of machine is actually the most in demand. This is probably due to the fact that although it is automatic, you still have a lot of control over how strong or how mild you want your espresso to be. The only con about this machine is that it doesn’t have a grinder. This means that you would need to buy pre-ground coffee beans. Unlike the semi-automatic one, this machine is fully automatic. You would need very little effort to get your espresso. It already has programmed specifications and you would just need to choose which one you would want for the day. When I first used an automatic espresso machine I was really amazed. I just pushed a couple of buttons, in fact, the number of cups I need can even be adjusted. It also has a built-in grinder so you don’t need to worry about anything else. This type of machine is also known as fully automatic machines. You need even less effort with this compared to the automatic one. These are usually considered as the best option when it comes to both results and capability. However, it is also the most expensive because it has all the frills that you would want in an espresso machine. This is the perfect choice for those who are on the go and would prefer just pressing a button and get the perfect espresso drink. This has a grinder and also includes all parts and pieces so it’s completely worry-free. Air pump-driven espresso machines are the new innovation introduced this year. Unlike the previous ones that highly depend on electricity, this one requires a bit of manual effort. You would need to manually compress the air into the coffee beans, forcing water to it. However, you should note that you also need to add boiling hot water to it and you would need to refill it with water if you want to have more cups. The great thing about this is that it very portable and you can easily bring it anywhere. This makes it a great choice for those who are always in the outdoors and even great for those who go on camping trips. Out of the five machines above, I would have to say that my favorite is the De’Longhi’s Espresso and Cappuccino. I believe that this is the best espresso machine under $200. I love how versatile it is and how slick it looks. It also has a very competitive price despite how functional it is. But, most importantly, it gives me great tasting and rich coffee any time of the day. Choosing the right espresso machine for you greatly depends on how much work you want to put on your coffee making. Of course, you can find cheap ones in the market quite easily but you might end up finding out that you would need to put on all so much effort because it turns out to not be as automatic as you would want. Regardless of your choice here, I hope that you end up with the best espresso coffee and that you love every sip. I do hope that you were able to find the perfect espresso maker for you. If you feel like I missed out on your favorite or if you have other tips, please comment them below. Until next time! Note: This post has been updated with new tips and info. We do our best to keep all of our reviews up to date.